Jump on board a waka hourua (double-hulled sailing canoe) and enjoy your own real life Waka Odyssey experience around Te Whanganui-A-Tara, Wellington Harbour. 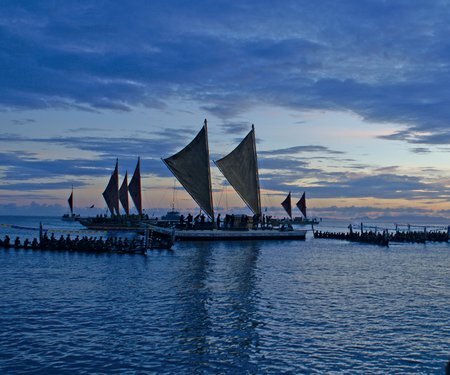 Be among the lucky few Festival-goers to experience one of these mighty Pacific sailing waka in action. You’ll meet the fearless voyaging crew and hear tales of their exciting ocean-going adventures, and see the unique waka design up close, before setting sail on an adventure of your own across the harbour. Enjoy the breathtaking sea views as you learn more about Pacific navigation from this passionate expert team. This is a strictly-limited, once-in-a-lifetime experience so book fast. There is limited space on the waka, so only essential belongings are allowed on board. Please arrive prepared with a small bag or keep your belongings on your person. Due to weather conditions, the harbour sails on Monday 26 February have been cancelled. Ticket holders are advised to contact Ticketmaster either by phoning 0800 120 071 or by emailing customer.help@ticketmaster.co.nz to move to an alternate sail time or request a refund. We apologise for any inconvenience caused. 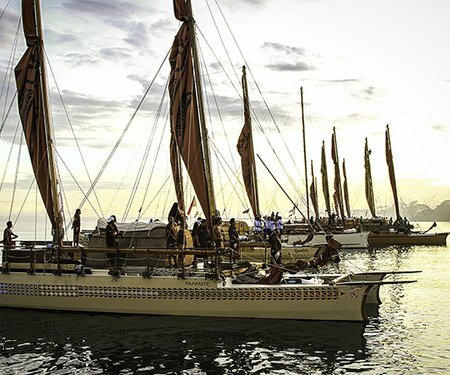 Waka Harbour Sails are a Kupe Dreaming event and part of A Waka Odyssey, a celebration of our place in the Pacific that includes the spectacular Kupe: Festival Opening Night. Download the A Waka Odyssey flyer to plan your journey.